When I found our new to us 2000 FV270 the dealer had already noted that there was a leak in the drive oil reservoir line somewhere in the engine compartment. They suggested that the Bravo III system is notorious for it, but usually just a fitting or line issue. As part of pre-delivery they supposedly "fixed" what they thought was a loose fitting at the tank. After the first initial sea trial we noticed the tank had dropped about a half an inch from the full line which we attributed to air in the system working its' way out and topped it up. A second run of about 30 minutes a few days later, and no visible drop in the oil level. Went for a real good run of about an hour the other day, mostly at 3400 RPM and up, so working the drive pretty good. As part of my pre-operational check I noted that the reservoir was still at the full line, but another check after the run and it was all the way down to the add line. Not sure how much oil that represents, but at least a few ounces I'm sure. I did note some oil in the bilge and could also smell that maybe some oil was hitting the manifolds and burning off. I don't see any oil slick at the transom, although I guess it's possible that if a prop seal was leaking while under drive pressure, it might not leak much while stationary? 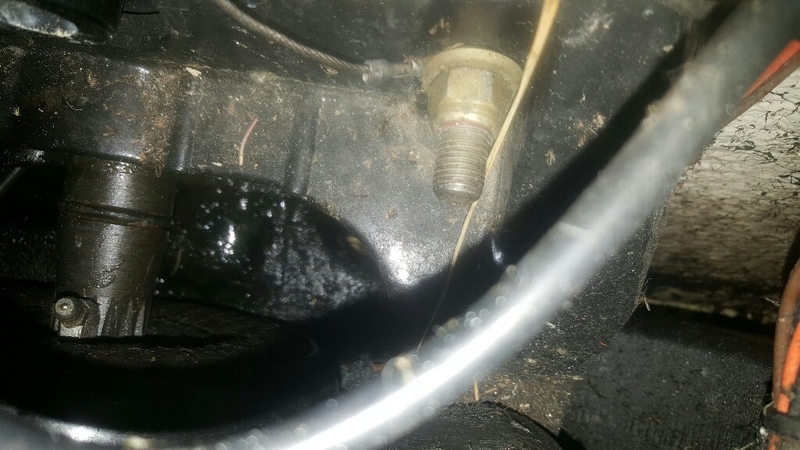 If it is leaking somewhere on the "wet" side, is there anything else I can look for, short of hauling the boat and checking the drive oil at the foot? Would I see any signs of water siphoning back into the tank? (oil in the tank is good, no froth, no discolouration.) Is it possible that it's still just air working it's way out of the system? A search here and elsewhere shows that it's a consistent issue, but ranging all the way from a leaky o-ring or fitting at the tank, to "oh my god, my drive bearings are shot"... so it's got me concerned. don't have any experience with that, just what I've read on here, there was some guy's had to replace the little reservoir tank, it had crack in it. at the bottom. It is common to take a couple of runs to get all the air out and 4oz is not uncommon.But you correct to keep a good eye on it. Rise and lower the drive at the dock and trun left and right(port and starboard)check for the oil slick it can hide under the swim platform. Was at boat today. Checked all around tank and followed hose all the way back ro fitting at the transom plate. Dry from what I can see. Not a great shot, but area around line is dry. Did see fresh drive oil down in where the deive shaft exigs though....trouble? Mine leaked on a hose on the right side of the drive on the outside of the drive. That hose and clamp are pretty common to fail. I think I accidentally posted two versions of the same pic. Was on my phone. But looking down, where the drive shaft meets the bell housing and exits the transom plate, I could see fresh oil sitting there. Bad seal I assume? Is it a critical problem, or if it is just an inner seal, can be fixed with the drive service I plan in the fall? I bet your bellow is full of oil. You probably need a seal job on the u joint. I waited until fall but noticed mine at the end of the season. You may want to fix it now if it's leaking bad. I would imagine that involves pulling the drive? Here's the pic I meant to post. Can see the oil under the drive shaft. Boat sat for over a year out of the water. Given that the issue seems to be a little intermittent I'm hoping things swell and seal. At least until I can do a full drive service in the fall. False hope? Will keep a close eye on it of course. Yes its an out of water job. Fortunately there is no water exposure, however i would be worried about further seal failure, and oil getting thrown everywhere as the shaft rotates. Basically every time you loose oil it is filling up the bellow even more. The only place for it to go is the bellow and whatever is able to slip by the gimbal bearing and into the engine room. Sometimes these seals fail just because of age. Other times you have a vibration in the drive, which is never good. I had to replace my upper yoke on the drive last year. Fortunately i caught it early before i really screwed something up in the drive. Well, some good news perhaps...technically this goes back to an issue that was supposed to be fixed at delivery, so I called the dealer today for a chat and I'm heading over there in the morning to discuss with their mechanic to make a plan to remedy. Hate to lose boat time, but better now than later in the season when the weather is better. Making slow progress. With the crappy weather, haven't been able to get a lot of run time on the boat, but after a few more runs the leak is definitely getting worse. Draining the reservoir tank from the full line to the add line in about a 20 minute run. Between my schedule and the tech's schedule we've finally agreed on next Thursday for him to travel down to my marina and take another look. He still feels that it's the plastic elbow fitting in the transom that is causing the leak and that although difficult he can replace it with the boat in the water. But he's bringing a trailer in case it has to go back to their shop to pull the drive. I had thought about speaking with them about doing a full drive service while they have it there if they have to pull the drive anyway, but now I'm thinking that I'll just let them fix whatever needs fixing for the oil leak as per the original sales agreement and be done with it. He seems like a capable mechanic, but I get the sense that their shop is geared more towards the prep and repair of the boats they are selling this time of year, and less towards on-going maintenance. Not a knock against them, they've been good so far in backing all the little items that came up during sea trial up to and including pulling the drive if needed and fixing the oil leak. I've already had a couple of chats with the mechanic at my marina about doing a complete service in the fall to include bellows, seals, gimbal bearing, shift cables and new anodes and mercathode. Feels he can do it for between $1500 to $2000 which I think sounds about right. So I'm thinking that might be the direction I'll go. If he has to pull the drive to do the oil line, have him replace the 2 bellows, shift cable and gimbal bearing. While he is there, just do it. I just had that done to my boat because of an oil leak. I agree. Was my first thought. But if you read between the lines in my longish post....not sure I want them doing all the work. Maybe get a better read from the mechanic next week. I would go with fixing the leak per sale agreement.Then plan a full redew in the fall.I would also reseal the drive in the fall(600+$).my feelings are if the drive leaks something going on in it. So, this issue is still on-going. Has the shop baffled. They are contacting Mercury to see if anybody there can figure out what is going on. I've put about 10 hours on the boat so far and the weird thing is that the leak is intermittent. About half the time it leaks oil all over the bilge, about half the time it doesn't. Trim attitude, RPM's don't seem to have any notable effect. Mechanic was at the boat the other day and changed the fitting shown as part # 5 in the pic which goes to the transom. Thought it might be cracked. Went for a ride for about an hour, and no oil loss. High fives all around. But next day, out for another hour and oil dropped half a tank all over the bilge. If it was a u-joint seal, would it not leak all the time? I'm wondering about part # 1, the other fitting inside the transom plate (at least, I think that's where it is located). Next step is to pull the drive which we've been trying to avoid. It does seem that perhaps the leak is happening after running for at least an hour and the drive is maybe heating up and pressurizing? One option that has been mentioned is to pull the drive and simply cap the system off. Not sure I'm comfortable with that, although plenty of drives don't have a reservoir system and I have heard of it being done. This is starting to feel like that movie, "Neverending Story". Have the mechanic scheduled to meet me at the marina on Thursday with a trailer to pull the boat. The shop seems convinced that it's the second fitting (item #1 in pic above) that is causing my leak, and furthermore they think they are going to be able to replace it without removing the drive. Their plan is to fix it while on the trailer. Is that even possible? I guess they want to avoid having to drag it back to the shop, about a 60 mile round trip. I'm unclear as to where that part is located. Can they get at it by pulling the bellows back? Anyone ever changed that piece? I believe they can reach that part from the inside. It's just a really tight area, but should be doable. Good luck and let us know how it goes. Replacing that fitting was one of the few things I paid a machanic to do as I could not see or even feel it. I believe they were able to do it without pulling the drive. Pulling the drive is not that hard, and gets easier every time, I have had mine off 5 or 6 times in the first 3 years. You can fix anything on the trailer, that drive can come off in an bout 15 min. Why are they messing around with this. Pull the drive and fix the upper seal crazy to let this go on and on Pull the drive and inspect. For what it's worth, I have the exact same problem. 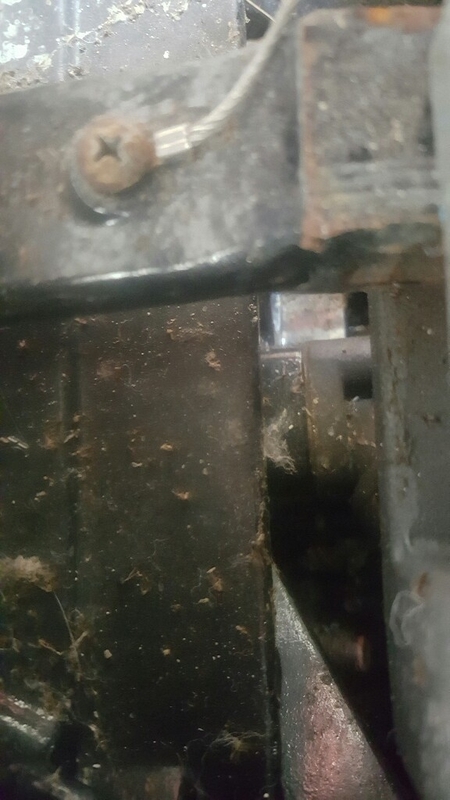 If you look at the bilge behind the motor you may see your leaked fluid there. I am having my boat pulled and both drives fully serviced. This is gimbals, bellows, shift cable and so on as you mentioned. My shop quoted me $1200 each. Your 1500-2000k may be high. Absolutely agree Alswagg. And were I dealing with a shop and tech with a better reputation like yours no doubt that's what should/would have happened by now. Been delays on both sides, some theirs, some mine, a lot caused by my refusal to let them work on the boat unless I'm there so scheduling has been difficult. Comes down to I really don't trust them, but I'm willing to let them keep trying because so far it hasn't cost me anything but a bottle of drive oil and a bit of time. Weather has also been a huge factor. Because they maintain that they had identified the leak and "fixed" it before delivery we were working under the assumption that the initial loss of oil was the system "burping" out air. It wasn't until several weeks later and being able to put more hours on the boat when weather improved that we realized that was not the case. I have suggested to the shop twice that it would be better off for everyone in the long run to just pull the drive and check/change the u-joint seal but they steadfastly maintain that they feel it is not the culprit based on the amount of oil being lost, that it would have to force it's way past the gimbal bearing, fill the bellows and then leak into the bilge. So they keep focusing on the fittings. Should have confirmation this morning that the tech is set up to meet me tomorrow morning. While we have the boat out on the trailer I'll be insisting that they pull the drain plug to take a look at the oil, do a pressure test if possible and have a good discussion on next steps if the fitting they want to change looks good. I've been documenting all the conversations, e-mails, visits by the tech etc. In a worst case scenario I get it fixed by another shop and take them to small claims court, but quite frankly I don't currently have the time or $$ for such an undertaking. I also don't want to lose the use of the boat for a great amount of time while we hassle it out. 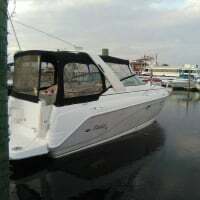 I've had the boat for 63 days as of today, and so far the dealer and I are still on "friendly" terms, I've been able to use and enjoy the boat (while having to add oil and clean the bilge from time to time) and otherwise she runs like a champ and looks great. I really do appreciate the advise and opinions of the members here, I think it's the support I value most and being able to "share" my issue while pursuing the fix. My prices in CDN $$. If you compare the exchange etc on parts, about the same. Quote was also an off the cuff "worst" case scenario in a conversation with the mechanic at my marina. You are correct, that is exactly where I see the fresh oil. @willhound - sounds like you are dealing with it well and enjoying the boat. That is great! Definitely take advantage when she's out on the trailer and get the drive pressurized. That will tell you where there are any leaks. Good luck! The way things are going, that might be what happens. Good news is that I had the tech confirmed to meet me and pull the boat this morning to see what we could do. Bad news is that I hopped down off the tailgate of my pick-up yesterday and felt a blinding pain in my foot and ankle and had great difficulty walking. 5 hours in ER, an x-ray and an ultra-sound later, they tell me I've partially torn my Achilles tendon. Heading back in this morning to see an orthaepedic specialist to see what, if anything, they can do about it. Getting around in a walking cast for now. I was able to speak with the tech by phone late yesterday and we've agreed to re-schedule for next Tuesday pending where I'm at. Worst comes to worst, he'll bring a helper and I'll bring a buddy and between us all we'll "git 'er done".